Get your bling on this wedding season with a customised outfit from Arshvi by Shraddha, a busy boutique just off Commercial Street. Prices start at about INR 600. Started off by Shraddha Sontakke, a fashion graduate, Arshvi is located on Narayan Pillai Street. The store specialises in customised clothing made for festive occasions like weddings. If you are looking for an outfit that will make you stand out from the crowd, at your next big do, then, this is the place for you. Since most of us ladies, are on a perennial hunt for the perfect blouse maker. You sure can give Arshvi a try. Prices begin at the INR 600 for stitching and if you want jazz things up with hand embroidery, then the designs begin at INR 1,000 and run up into lakhs. At the store, we spotted samples with elegantly-done floral work and think they will be worth your buck. Hitting up a shaadi? Then, swing by here to get your lehenga stitched. 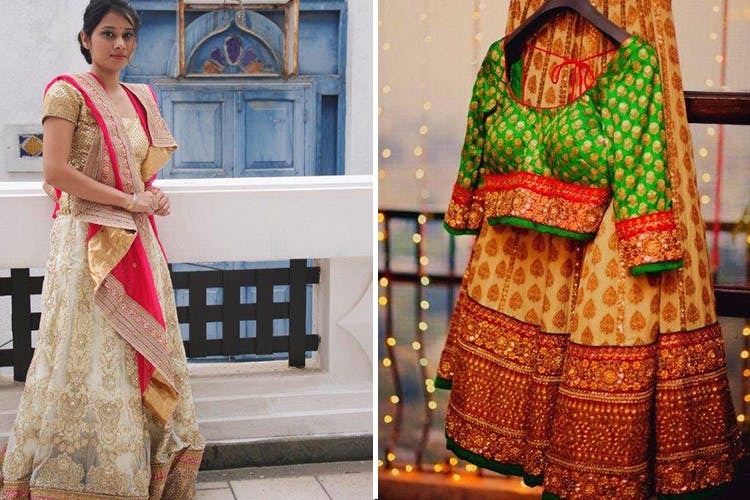 A Plain Jane lehenga will cost you about INR 1,200 to get stitched. But the prices climb as you add panels and layers. Elegant dresses too are an option here and stitching charges begin at INR 600. At Arshvi, you can either bring in your own designs and fabric or get Sontakke to come up with ideas. They can even source fabric for you. The boutique also offers hand-block printing and dyeing. Sontakke tells us that while they mainly concentrate on the ladies and the kiddies at the store, for pre-wedding shoots they make complementing clothing for the bride and the groom.